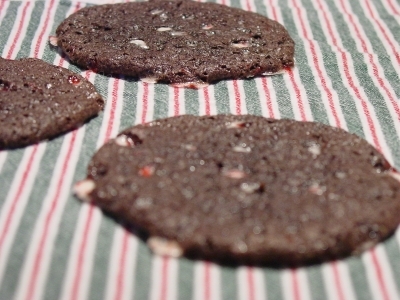 Rich in cocoa flavor, these lovely Christmas cookies arepunctuated by crunchy bits of mint. I didn’t add the crushed candies to the batter, thinking it would be too much but I regret that decision. An additional minty snap would have added a nice counterpoint to the chewiness of the chocolate cookie. A note: I chilled the batter overnight (only 30 minutes in the refrigerator caused the cookies to spread too much), then rolled tablespoonfuls of the batter into balls, squashed them into disks, and pushed the tops into the crushed candies. Preheat oven to 325 degrees F. Whisk together flour, cocoa powder, baking soda, and salt in a medium bowl; set aside. Melt chocolate and butter in a heatproof mixer bowl set over a pan of simmering water. Attach bowl to mixer fitted with the paddle attachment. Add sugar, extracts, and eggs; mix on medium-low speed until combined. Reduce speed to low; mix in flour mixture. Stir in one-third of the candies. Refrigerate dough until firm, about 30 minutes (or wrap in plastic and refrigerate overnight). Using a 1 1/2-inch ice cream scoop, form mounds of dough; dip tops into remaining candies to coat. Place cookies, candy sides up, on baking sheets lined with parchment paper, spacing 2 inches apart. Bake cookies until just set, about 15 minutes. Let cool on sheets on wire racks. Cookies can be stored in an airtight container at room temperature up to 3 days. Makes about 3 dozen. ← Five Days Left ’till the RRC#5 Deadline! these sound great! I love chocolate and peppermint together!